Metal Mire mesh - can be bought from any hardware/DIY store. Wire cutters, Pencil, Saw. Wood strips, 1cm squared, length of wood needs to be able to produce 9 lengths for the split. We used a UK 10 Gallon tank, the tank being 18'' x 12'' x 12''. As we are doing a double split, we need 9 lengths all 12''. These are cut to length, sanded down if needed and then glued in using the aquarium sealer - this needs leaving for 24-38 hours. N.B you may need to remove the glass lips on the tank first, you can do this by using Acetone or by cutting it with something like a cheese cutter. The wood is left to dry, and on the bottom pieces a heavy object was placed to keep them under pressure and glued nice and tight, and the side pieces were held using some cellotape, this helped keep them in place whilst drying. 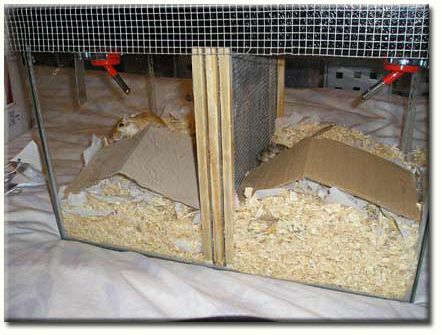 The next day we were able to begin cutting the mesh and put the gerbils in as the glue was dried. Once you have done that, your split-tank is finished! Now you need a lid, which too can be made out of the wire mesh, and you're ready to go. Whenever introducing two strange gerbils to each other, always use the split-tank method. This way you can guarantee no fights between your two little fuzzies. The method may take days or weeks to successfully introduce two gerbils, it all depends on their own personailities. Some will accept eachother straight away, whilst others may take weeks to do so. The Split-tank works on allowing your gerbils to smell, see and to some extent touch each other without being able to do any damage or harm to one another. As gerbils are highly territorial, if you were to simply put them in a tank together the chances of them fighting is extremely high, especially if adults, and they will most likely fight to the death. You need a tank of some sort, a glass aquarium is best. 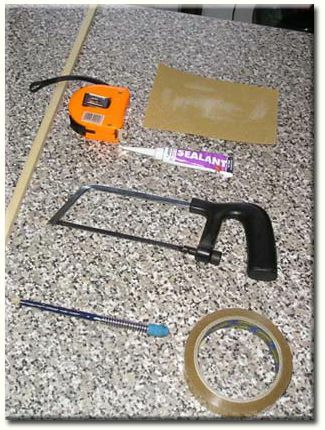 This needs to be divided somehow using wire mesh, you can glue wooden batons to the side of the glass using sicilone aquarium sealant - this is non-toxic for fish and so it is perfectly safe for gerbils, and then slide the mesh between them. A double layer of mesh is best, otherwise you could end up with gerbils missing a toe on a paw or having a bite to their nose. Sleeping in the nest of the other gerbil and/or both sleeping next to the divide. Once they are showing these signs, then perhaps try removing one of the sheets of mesh, so that there is only one layer dividing the two, see how they both react to this and if all the above signs are being met then remove the final divide. They should get along fine, be sure to watch them carefully until they are asleep together in the same nest. When they are asleep together you can be pretty certain that the introduction has worked. You can try putting them both in a freshly cleaned tank, where there is no scent, I know a lot of websites advise this, but in fact this is wrong and is going against the whole idea of the split-cage method. The point of the split-cage method is to get the two gerbils USED to the scent of each other, by removing the now familiar scents of both you are rendering the method completely redundant. When removing the divide be sure to keep the tank rather bare, this way you'll have no fights over territory - if there's nothing in there except a water bottle and tissue then there's no cause for arguments.